Those two words that parents and caregivers hate to hear from kids. Most kids count down the last few weeks, days and even hours of school for that awesomeness of summer break. But just a few days in, it starts. 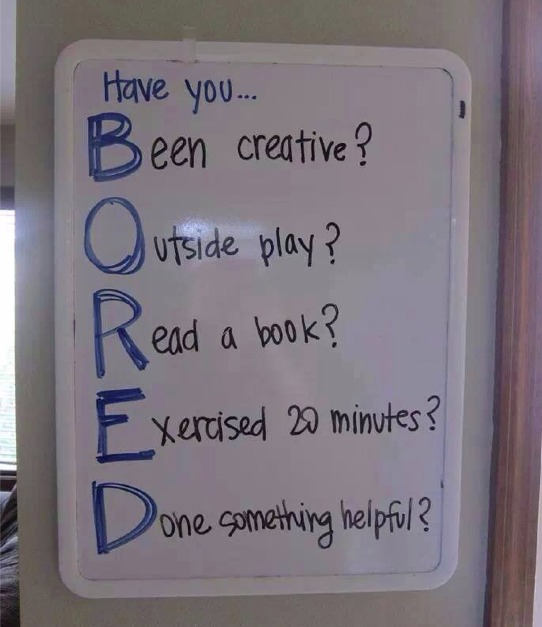 How about sharing this new meaning of the word "BORED" with your child? Let's make a deal that every time we hear a child say this, we'll ask these questions! And, if you need camp or program ideas for the kids while they are out-of-school this summer, simply text GETCONNECTED to 96714. Enter your zip code and your child's age and options will be sent to you! A lot of these activities, camps and programs are low cost or free! And lastly, from our friends at the Kentucky Governor's Office of Early Childhood, here are some easy ways to engage your children this summer, including alphabet hopscotch, an obstacle course and online resources. Kids can lose up to two months' worth of math and reading skills in the summer, so let's keep them learning while school is out! How do you help your child avoid summer boredom?